From June 2018 until January 2019, BlueLink Foundation provided expert inputs to the Eastern Partnership Civil Society Forum project Environmental Assessment Watch (Implementation of SEA and EIA: civil society monitors the situation in countries). Plamen Peev, senior legal and policy advisor of BlueLink, was involved in development of a methodlogy for public monitoring of environmental assessments (EA) implementation in Belarus, Republic of Moldova and Ukraine based on analysis of existing legislation and practices in these countries. Strategic Environmental Assessments (SEA) and Environmental Impact Assessments (EIA) legislations have been listed among key priorities in Eastern Partnership (EaP) programing document ”Eastern Partnership - 20 deliverables for 2020”. It has been an ambitious and challenging task for the project countries to implement them in accordance to EU environmental law, as well as in compliance with the relevant international Conventions (e.g. the Aarhus Convention). Both assessments set procedural requirements for assessments of the impacts on the environment of the plans and programs (SEA) and of the investment projects (EIA), thus contributing to better governance for sustainable development. The project included Ukraine and Moldova as countries with Association Agreements with EU and Belarus which does not have such an agreement. The uneven EU integration process, as well as the different country contexts provided the project team with a good basis for comparison and analysis of the state of environmental democracy in general. The project has investigated the situation in three EaP countries collecting good and bad examples and presenting them at international level as well. 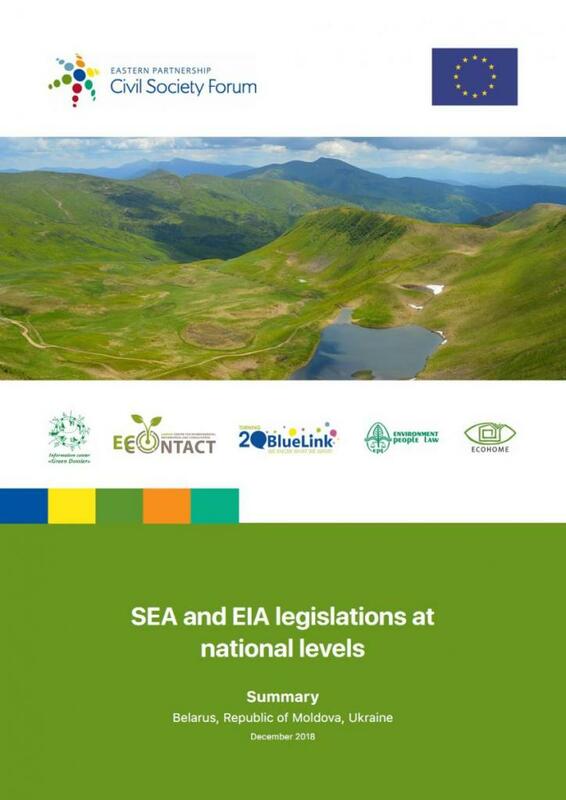 The analysis of SEA and EIA legislation and implementation at national level brought up common problems and needs. One of them is lack of public attention and real involvement in the assessment procedures. This phenomenon could be be explained by two main reasons — lack of interest due to unawareness of the potential adverse effects of a project/program or disbelief that the participation can make any difference or due to intentional manipulations by the project or programme developers. In Belarus, for example, people usually miss EIA stage, and become active only when they face the real impacts of the projects in their implementation. The public theoretically has the right to participate earlier, but it does not use it effectively because of above reasons. Among the other problems are the difficulties to follow the progress and the low quaity of the EIA/SEA reports. The information even if available is rather difficult to trace or search. In Moldova, according to the Association Agreement, an open EIA register was created, but it is a simple table that includes scarce information. It was estimated that for the eight months in 2018 15 requests have been submitted to central environmental authorities. In addition, the register does not allow one to follow the current status of the procedures and whether public consultations have been initiated; there is no access to EIA cases, due to the fact that files are not available online. In Ukraine, the new EIA law has been in force since December 18, 2017; the public EIA register is active and regularly updated with more than 1000 entries for now, but there is a problem to navigate all these entries. The amount of public involvement has been rather high — over 25% of the procedures got comments from the public. On the whole, the quality of the EIA reports and expertise available are the weakest points for the EAs in all countries. There are mainly available only old system’s certified experts that lack the understanding of potential social and environmental risks. Although, Bulgaria was given to the EaP countries as a good example in general because of its system for EIA/SEA procedures based transposition of the EU Directives into the national legislation, some problems were emphasized like the barriers to meaningful and inclusive public participation. Formally, the law provides a broad access to public participation and to access to information and justice. However, the lack of public consultations at the screening stage and the practice to bypass the conducting of full SEAs for plans and programmes with potential negative environmental impacts, or to not conducting of SEA at all, are persisting problems. The project was presented at the Eighth Meeting of the Task Force on Public Participation in Decision-Making of Aarhus Convention (Geneva, 8–9 October 2018). Project partners from ICO “Green Dossier”, Public Association “Ecohome” and BlueLink (on the picture) informed the Task Force participants about the first findings of the project in the field of effective public participation, in particular about availability of relevant documents to the public in the project target countries. procedures implementation) which the civil society could implement in thier monitoring of the preparation and implementation of the strategic documents and projects. The more these tools are used, the better management and governance practices will be implemented in the EaP countries, thus empowering everyone to have a say in shaping the future of his/her place, region and country.